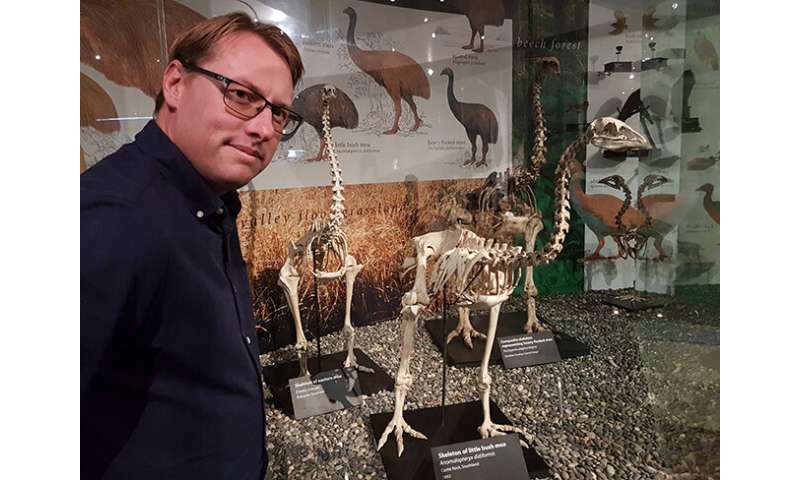 University of Otago researchers in association with colleagues from Harvard University have discovered new evidence of what made some of New Zealand's iconic birds such as the kiwi and extinct moa flightless. Rather than obvious physical features like small wings, the study identified the molecular roots of the loss of flight seen in a wide variety of these types of birds by precisely analysing DNA. The study, "Convergent Regulatory Evolution and Loss of Flight in Palaeognathous Birds," has been published today in Science. "This work tells us more about the origins of moa and kiwi. It supports the hypothesis that the ancestral moa flew here, while the ancestral kiwi, which is related to the emu may have walked, or indeed flown from the likes of Australia or Madagascar over the ancient Gondwanan continent," says Dr Paul Gardner, of Otago's Department of Biochemistry. Dr Gardner co-authored the study alongside his former student, Dr Nicole Wheeler. By comparing the DNA sequences between the different birds, these bioinformaticians have found that it's mostly the regulatory DNA, not the protein-coding DNA that explains the similar loss of flight across the ratite birds. This suggests the change in the regulation of the protein genes, rather than the proteins themselves is what is responsible for the loss-of-flight changes in the birds. In contrast with previous work, which emphasised changes to protein-coding DNA as driving flightlessness, this study associates loss of flight more strongly with regulatory evolution in noncoding DNA. The results provide an example for future genome studies of so-called convergent phenotypes throughout the animal kingdom. The work was predominantly carried out by colleagues at Harvard University, in particular Professor Scott Edwards and Dr Tim Sackton. "They were very gracious in allowing us to contribute to their very interesting study. Also, we must acknowledge Ngāi Tahu and Te Āti Awa iwi, who permitted genetic analyses of kiwi blood samples obtained from their lands. The moa and kiwi samples were collected by the late Allan J. Baker, an ex-pat New Zealander based in Toronto. Due to this collaboration, we now have a better idea now that the places of the genome that we concentrate on, the protein-coding genes, may not in fact be the ultimate source of species diversity and change," Dr Gardner adds. "Regulatory" DNA is responsible so are you saying its been adjusted by epigenetic effects? Epigenetic effects are not evolutionary mechanisms as much as their mechanisms are caused by evolution. Non-coding regulation can be through gene promotors or diverse RNA expression, without necessarily being under epigenetic control [ https://en.wikipe...pression ].